Zeal Bath and Pool Thermometer is a fully floating, waterproof thermometer specially designed to measure the temperature of baths, ideal for parents and carers looking after dependents and swimming pools, perfect for private pool owners and public swimming pool owners heightening their customer experience. 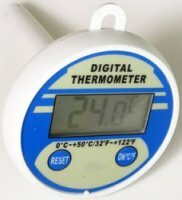 The Digital Thermometer was a replacement for a Digital Temperature and Light (Lux ) meter which had failed after 40+ years of faithful service. It performs well although I would have preferred an Instant Temperature read out. The Zeal P1511 ticks slowly, a second for each tenth of a degree. However I will get used to it. Thank you. This should last longer than previous purchases from other retailers that had a habit of staying on permanently. More robust than the children's ones. As a swim teacher i need a fast reading of what the pool temp is before I allow young swimmers to start their lessons. This product does the job perfectly, fast reading and cuts out after 3 minutes thus saving battery power.